I have a new article up on gamesindustry.biz exploring the psychological appeal of violent shooters via self-determination theory. I draw from work by Scott Rigby, Richard Ryan, and Andrew Przybylski that looks at how this theory of human motivation can explain why violent shooters are so popular. 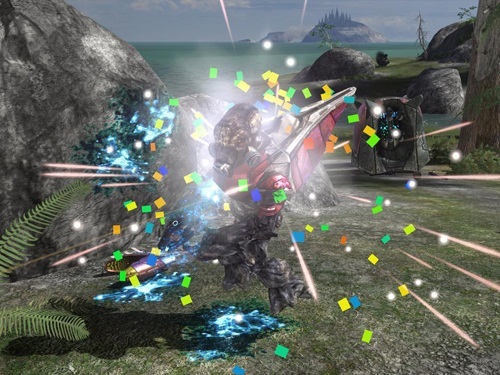 Remember that skull in one of the Halo games that would make Grunts explode with confetti and a delightful “Yaaaaaay!” when you headshot them? Great indicator of competence. SPOILER: It’s because good shooter design also happens to satisfy three basic psychological needs: competence, autonomy, and relatedness. Then to take things a step further, I looked at some research that tried to separate the “violent” from the “violent shooter” and see if these needs could still be met without all the gore, guns, and grunts. So while RPGs might nail autonomy, platformers may demand competence, and MMOs may allow the most relatedness, violent shooters fire on all three cylinders. “[Violent games] are fun not because of the blood and gore,” write Rigby and Ryan, “but because games of war and combat offer so many opportunities to feel autonomy, competence, and the relatedness of camaraderie rolled up into an epic heroic experience.” But, that all said, do shooters satisfy all these motivators so well because they’re violent? It’s an important question, and Ryan, Rigby, and their colleague Andrew Przybylski published a 2009 study in the Personality and Social Psychology Bulletin that addresses it. Part of their research involved a clever experiment where they modified Half-Life 2 to create a high-violence version of the game’s multiplayer and a low-violence version. The high violence version is pretty much what you’d expect. The low violence one, though, was created by changing the bullet-spewing guns into “tag” tools that players would use to zap opponents. Once tagged, foes would freeze and float up into the air for a second before being harmlessly teleported to a “penalty box” where they would wait to respawn into the game. You can read the whole article to see what the researchers found out. Still, why let reality get in the way of a promotion.